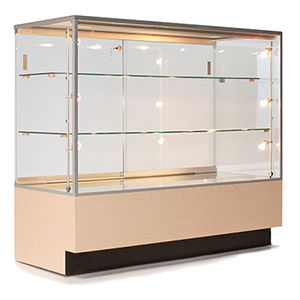 All of our display fixtures are designed and manufactured to suit each individual clients needs. We have standard designs and options to be added to custom displays. 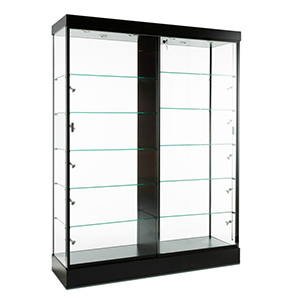 All our cases can be made in our standard finishes and also in any laminate on the market. All we need is the manufacturer's brand name and the reference number. Solid wood is also available. We can work with your architect and designer or directly with you. We can create different layout concepts based on the aesthetics of the store and on a functional usable space. Our goal is always to complete your project according to your specifications, your schedule and your budget. Once your order is finished, the goods can be shipped crated to you via trucking companies or blanket wrapped through moving companies. When remodeling a whole store or opening a new store, we recommend blanket wrapped shipping as the showcase will be delivered right into your space and you will save time, energy and costs of uncrating.